More than 65 members from around the world gathered at Meridian 180’s 2nd Annual Global Summit in Brussels, Belgium, to strengthen ties started on Meridian 180’s online forums, and to dive into new research initiatives around the conference theme of “Responding to the Rise of Inward-looking Societies: Building New Models of Cooperation.” The conference was held at the Steigenberger Hotel from May 19 to 21, 2017. The aim of the conference was to bring the collective expertise of a broad group of experts to address the changes and challenges in trade, migration, security, and energy caused by the rise of nationalism and the fracturing of the global ideal. Focusing on policy areas through a multidisciplinary vantage point is a special element of Meridian 180’s work model. Over the course of the conference, economists, legal scholars, scientists, historians, anthropologists, linguists, and sociologists from Asia, Europe, Australia, and North America worked in concert with policymakers and members of industry and business to examine the effects of nationalism and closing borders on four “idea streams” or policy areas of Immigration, Energy, Trade, and Security. 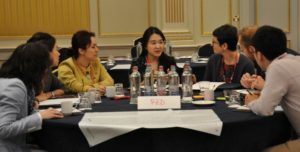 In the Trade idea stream, participants spoke one after another based on connections that they felt between the previous speaker’s insights and their own, resulting in a far-ranging yet organic discussion that created new linkages, such as between the role of regulation in trade and indigenous rights. The final presentation was in the form of a theatrical polemic in which the participants shouted the most extreme, unbalanced statements about trade they could think of, provoking—in many sense of the word—emotion and discussion. First, the backlash against free trade reflects intractable conflicts between positions on this issue. These conflicts are not only intellectual but emotional as well, reflective of values and ways of life. The emotional response is not an irrelevant byproduct but indicative of just how deep this conflict goes. Second, the performance itself also shows in small part the power of populist movements. The point of the exercise was to shout unreasonably extreme statements, not caring about being right or listening but just trying to be heard with sheer volume. The experience left participants and the audience alike wondering: What does it feel like to be no longer bound by facts and moderation? Does it feel like power and liberation? Are the experts really more measured, or are they just better at disguising their primal screams? Third, the way forward on the issue of trade must therefore be not only intellectually rigorous in regards to what people do when it comes to trade but also how people feel, including the researchers themselves. Trade should be about the people who live its realities, and any effective suggestions or prescriptions must integrate not only the findings of multiple disciplines for a multidimensional view of trade but also the self-examination of the researchers themselves. The final presentations of the three other idea streams, energy, security, and migration, were equally thought-provoking. In the energy idea stream, exploring areas of cooperation among the different stakeholders in the energy sectors was identified as a path forward toward productive dialogue among nation-states. The security idea stream expanded the definition of security to include important issues such as food security, energy security and physical security, and focused on the need to have a broad international conversation about the multidimensional aspects of security with a diverse representation of stakeholders. After two days discussing the complex issues of immigration and culture, the migration group presented the act of telling a story as a starting point to collaborating on an interdisciplinary level and having some possible impact on increasing understanding of the complex and emotional issue of immigration.